These team icons are simple and clean for any background. To install our image rank pack, simply follow these easy steps! 1. Upload the rank pack to your web server. I use this: "http://teamfod.com/images/ranks/rank_packs_go_here"
3. Select "Users & Groups"
7. Done...in some cases you will need to hit F5 and refresh to see changes. We do not offer psd's with our free releases. If you wish to purchase any of our psd files, it will be a $2.00 charge. Visit us at http://www.teamfod.com for all your support questions or purchasing information ! Please rate my graphics and support threads via the community forums! My Design Of Great Forum Ranks Can Be Used For Dark or Light Websites! I Know Alot of People Have Been Waiting For These. 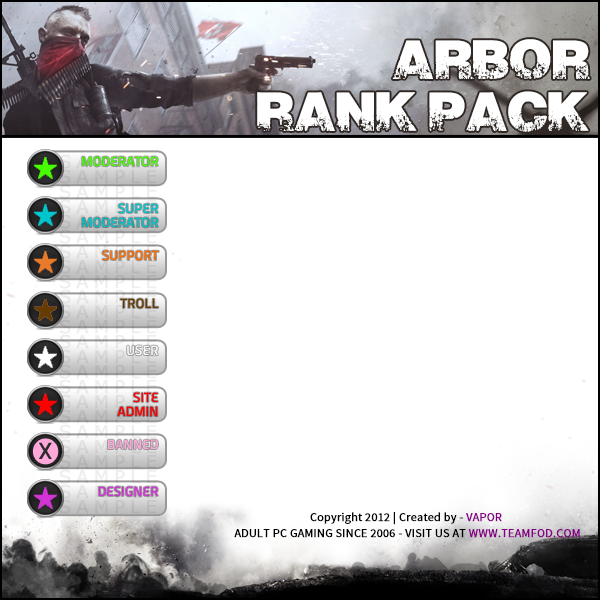 So Here You Go a Great Pack Of Ranks, My First Set I Will Be Releasing More Later This Week.